CUT eggs lengthwise in half. REMOVE yolks to medium bowl. RESERVE 24 white halves. Finely CHOP remaining 4 white halves and set aside. SPOON 1 heaping tablespoon of yolk mixture into each reserved egg white half. REFRIGERATE, covered, to blend flavors. SPRINKLE with paprika just before serving, if desired. No-mess method: Combine filling ingredients in a 1-quart plastic food-storage bag, press out air and seal bag. Press and roll bag with hand until mixture is well blended. Push filling toward one bottom corner of bag. Snip off about 1/2-inch of corner. Squeeze filling from bag into egg whites. 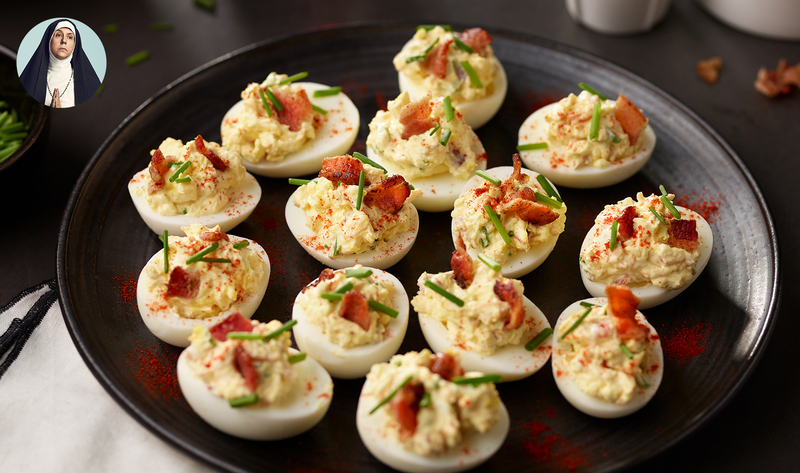 Make ahead: Deviled Eggs can be made up to 12 hours ahead. Keep covered and refrigerated. To peel a hard-boiled egg: Gently tap egg on countertop until shell is finely crackled all over. Roll egg between hands to loosen shell. Start peeling at large end, holding egg under cold running water to help ease the shell off. Hard-boiled egg storage time: Hard-boiled eggs in the shell can be refrigerated safely up to one week. Refrigerate in their original carton to prevent odor absorption. Once peeled, eggs should be consumed within two days. Portable tip: Prepare filling in plastic bag, as above. Carry whites and yolk mixture separately in plastic food-storage bag. Fill eggs on the spot, pressing filling out of snipped corner of bag.